The U.S. state of Oregon has various policies restricting the production, sale, and use of different substances. In 2006, Oregon’s per capita drug use exceeded the national average. The most used substances were marijuana, methamphetamine and illicit painkillers and stimulants. Oregonians consume an average amount of beer and distilled spirits, and an above average amount of wine. As of 2007, the consumption of spirits is on the rise, while beer consumption is holding steady. Also, 11% of beer sold in Oregon was brewed in-state, the highest figure in the United States. 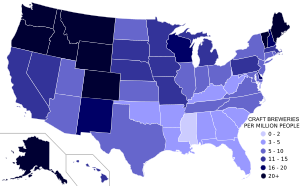 Oregon was the first place in the United States to prohibit alcohol, prior to becoming a U.S. state in the mid-19th century. That law was quickly repealed, but Oregon again preceded the rest of the country in outlawing alcohol, passing a law several years before federal prohibition was enacted with the Eighteenth Amendment to the United States Constitution. Following the repeal of prohibition in 1933, Oregon acted swiftly to regulate alcohol, establishing the Oregon Liquor Control Commission (OLCC) within days of the repeal. The OLCC continues to regulate alcohol in the state today. From 1999 through 2005, the ratio of Oregonians using cannabis outpaced the general United States population by 32–45%, with between 6.53% (2000) and 8.96% (2002) of the population using it. In 2003–2004, Oregon ranked among the top five states for cannabis usage of people 12 and older. Oregon is also one of the largest cannabis producing states, ranking fourth in indoor production, and 10th overall in 2006. In 1973, Oregon became the first U.S. state to decriminalize the possession of small amounts of cannabis, and in 1998 the state legalized its use for medical purposes. An attempt to recriminalize possession of small amounts of cannabis was turned down by Oregon voters in 1997. In June 2010, Oregon became the first state in the country to reclassify marijuana from a Schedule I drug to a Schedule II drug when the Oregon Board of Pharmacy voted for reclassification. In Oregon, MDMA (3,4-methylenedioxymethamphetamine), GHB (gamma-hydroxybutyrate), ketamine, and LSD (lysergic acid diethylamide) are available in varying quantities and are generally used at social venues in more populated areas and on college campuses. Club drugs enter Oregon from a variety of sources: MDMA from Canada, ketamine from Mexico, and GHB and LSD from California. Laboratory seizures indicate some local GHB and LSD production. GHB is also obtained from Internet sources. PCP and Psilocybin mushrooms are generally available in and around cities with a college student population. Cocaine is available throughout Oregon, and crack cocaine is available in some urban areas. Mexican traffickers dominate wholesale distribution, transporting the drug from Mexico, California, and other southwestern states. Retail quantities are primarily sold by Mexican drug trafficking organizations, street gangs, prison gangs, and local independent dealers. In 2007, 63.7 pounds of cocaine were seized by federal authorities, up from 36.4 pounds in 2006. In the 1990s, potent and inexpensive heroin became widely available in Portland; heroin use in Multnomah County rose 600% during that decade. According to police, in 2008, heroin became more plentiful in Oregon in response to a crackdown on methamphetamine. In 2007, 115 heroin overdoses resulted in death, up 29% from 2006. In 2012 heroin was responsible for 147 deaths, and the leading cause of overdose deaths in the state. The number of deaths is far below the highs of the late 1990s. Most deaths are a result of the user misgauging their tolerance. Heroin is especially lethal because it depresses the central nervous system, unlike cocaine and meth which are stimulants. In Oregon, black tar heroin comes from Mexico up the Interstate 5 corridor. In 2007, 19 pounds of heroin were seized by federal authorities, more than double the amount in 2006. Since its arrival in the early 1980s, the use of methamphetamine in Oregon has become a serious public health problem. Abuse of the methamphetamine (commonly known as “crystal meth” or simply “meth”) has spread across the state and the rest of the United States. The issue has been a focus of media organizations in the state, and has been a focus of several political campaigns, including that of Attorney General-elect John Kroger in 2008, and ballot measures such as Measures 57 and 61 in the same year. In 2005, Governor Ted Kulongoski signed legislation that made Oregon the first state to require prescriptions for cold medicines containing pseudoephedrine, one of the key ingredients used to make methamphetamine. The state had previously required buyers to show ID and sign a log when buying cold medicine like Sudafed and Claritin D. The intent of the law was to reduce the number of home methamphetamine laboratories. Oregon’s monthly home drug lab seizures dropped from 41 to nine after the restrictions were put in place, but the drug is still available, coming from Mexican labs and from other states. Meth-related deaths decreased for the first time since 2001, when 2007 deaths declined 21% from 2006 deaths. In 2007, 33 pounds of meth were seized by federal authorities, down from 101.6 pounds in 2006. Illicit use of prescription drugs is the fastest growing category of illegal drug use. Treatment admissions for illicit prescription drugs increased 332% from 1998 to 2008, surpassing cocaine admissions in 2005. In the United States, the primary methods of diversion of legitimate pharmaceuticals is illegal dispensing and prescribing by physicians, illegal distribution by pharmacists, prescription forgery, doctor shopping, and drug thefts from pharmacies, nursing homes, and hospitals. Pharmacy burglaries are prevalent throughout the state and Diversion Investigators are also encountering pharmaceuticals that have been purchased via the Internet without a doctor’s prescription. The use and sale of oxycodone (OxyContin, Percocet, Percodan), hydrocodone (Vicodin, Lortab), and anabolic steroids are of concern to the Drug Enforcement Administration. Also, as of January 2008, methadone use has increased dramatically in the state. Oregon’s Tobacco Prevention and Education Program (TPEP) was launched in 1997 to “reduce tobacco-related illness and death” by reducing exposure to secondhand smoke, countering pro-tobacco influences, helping users to quit, and eliminating health disparities. The current tax on a pack of cigarettes is $1.18, and the wholesale tax on other tobacco products is 65%. House Bill 2122 would raise the cigarette tax by $0.60, and the wholesale tax to 95%. Smoking in bars and similar businesses is prohibited in Oregon as of a law that took effect January 2009 (SB 571 of the 2007 legislature.) In the late first decade of the 21st century, the tobacco lobby has heavily funded the Oregon Republican Party‘s legislative caucuses. In 2008, academic researchers began studying waste water at various Oregon sewage plants, to evaluate the drug use of various communities. Their research is pioneering the field in the United States, though similar studies have been done in Europe. Every one of the samples, taken from 96 plants, contained methamphetamine; Cocaine was present in 80% of the samples, MDMA in 40%. the research is ongoing, and will evaluate some of the plants—along with plants in Washington—over time. Heroin, LSD, peyote, mescaline, and psilocybin are Schedule I drugs, and with the exception of marijuana their manufacture or distribution is a class A felony carrying a maximum of 20 years in prison. Opium, cocaine, amphetamine and methamphetamine are Schedule II drugs, whose manufacturing or distribution is a class B felony, and can carry a sentence up to 10 years. However, Oregon uses a felony “grid block” system for the sentencing of nearly all felony crimes including all drug crimes which takes into account the severity of the crime and the criminal history of the defendant. In actuality, sentences imposed in drug delivery cases are much less than 20 or 10 years, despite being class A or B felonies. Manufacturing and distribution cases involving very large amounts of drugs are often passed to the U.S. Attorney for prosecution. Under the federal guidelines, sentences can be much longer, exceeding 20 years in some cases. Dealing more than four ounces of marijuana is also a Class B felony. Depressants, and PCP are Schedule III drugs, and various prescription drugs are a Schedule II. The sale and distribution of Schedule III and IV drugs carry lighter penalties than the ones associated with Schedule I and II. The penalties for sale of a controlled substance varies between states. In Oregon, a person convicted three times of selling 3.3 pounds of meth would face a maximum of four years in prison. By comparison, the potential penalty would be 13 years in prison in California, 21 years in federal court, and up to life in Texas. Former Oregon lawmaker Kevin Mannix wants to increase these penalties, saying the state “invites” criminal drug activity “by being passive.” Mannix put a citizen’s initiative on the November 2008 ballot, Measure 61. The measure was defeated, while a less expensive measure referred by the legislature, Measure 57, passed. Mannix’s opponents argued that increased mandatory minimum sentences remove judicial discretion and send small-time dealers into expensive prisons instead of drug treatment. ^ a b Bernstein, Maxine (August 7, 2008). “Oregon’s drug use exceeds national average, study says”. The Oregonian. Retrieved January 19, 2009. ^ “Top metropolitan areas for beer, 2004”. Beer Handbook. Bev-AL Communications, Inc. January 1, 2005. Retrieved December 22, 2008. ^ Dininny, Shannon (January 13, 2008). “Wash. entrepreneurs getting into the distillery business”. Seattle Times. Archived from the original on May 24, 2011. Retrieved December 23, 2008. ^ “Oregon Liquor Control Commission (OLCC) Administrative Overview August 2000” (PDF). Oregon Secretary of State. Retrieved December 22, 2008. ^ “OLCC celebrates 75 years of responsible sales and service” (PDF) (Press release). Oregon Liquor Control Commission. December 11, 2008. Archived from the original (PDF) on May 2, 2009. ^ “Oregon Marijuana Statistics”. Rapid Detect Inc. December 5, 2008. Retrieved December 17, 2008. ^ “Oregon marijuana use among highest in U.S.” Portland Business Journal. April 6, 2006. Retrieved December 17, 2008. ^ Gettman, Jon (December 2006). “Marijuana Production in the United States (2006)” (PDF). DrugScience.org. p. 11. Retrieved December 18, 2008. ^ a b Schlosser, Eric (December 5, 2005). “The Politics Of Pot: A Government In Denial”. Rolling Stone. Retrieved December 17, 2008. ^ Dworkin, Andy (June 20, 2010). “Recognizing medical marijuana, state pharmacy board changes its legal classification”. The Oregonian. Retrieved September 15, 2010. ^ Schnabel, Gary A. (June 29, 2010). “News Release: Marijuana is not available by prescription” (PDF). Oregon Board of Pharmacy. Retrieved September 11, 2010. ^ KVAL News (June 17, 2010). “Oregon Board of Pharmacy vote a marijuana milestone”. KATU. Retrieved June 26, 2010. ^ a b c d “DEA Briefs & Background, Drugs and Drug Abuse, State Factsheets, Oregon 2008”. Drug Enforcement Administration. Retrieved January 19, 2009. ^ a b “DEA Briefs & Background, Drugs and Drug Abuse, State Factsheets, Oregon 2007”. Drug Enforcement Administration. Archived from the original on March 7, 2009. Retrieved January 19, 2009. ^ Lydgate, Chris (1999). “The fatal pinprick: Deaths from heroin overdose in Multnomah county”. Willamette Week. Retrieved April 21, 2009. ^ Craig, Paul (2013). “Heroin is leading cause of drug-related deaths in Oregon”. KPTV. Retrieved September 29, 2014. ^ Yim, Su-Jin (June 22, 2008). “Oregon fears heroin is tempting more kids”. The Oregonian. Retrieved January 19, 2009. ^ a b “Heroin in Oregon”. The Oregonian. June 22, 2008. Retrieved January 19, 2009. ^ a b “Meth: The Oregon Front”. Oregon Public Broadcasting. 2006. Retrieved January 19, 2009. ^ Reed, Jason (October 19, 2007). “Attorney general candidate focuses on drug problems”. Oregon Daily Emerald. Retrieved January 20, 2009. ^ “House Bill 2485” (PDF). 74th Oregon Legislative Assembly. 2005. Retrieved January 19, 2009. ^ “Mom Smoked Meth While Breast-Feeding Son”. CBS News. August 17, 2005. Retrieved January 21, 2009. ^ “Oregon to Require Prescriptions For Medications Linked to Meth”. The New York Times. August 17, 2005. Retrieved December 30, 2008. ^ Suo, Steve (June 2, 2006). “U.S. shifts meth fight to blocking ingredients”. The Oregonian. Retrieved December 30, 2008. ^ Bernstein, Maxine (August 7, 2008). “Oregon’s drug use exceeds national average, study says”. The Oregonian. Retrieved December 30, 2008. ^ “Tobacco Prevention & Education Program (TPEP)”. Oregon Department of Human Services. Retrieved February 26, 2009. ^ Graves, Bill (February 20, 2009). “60-cent-a-pack tax asked to cut back on smoking”. The Oregonian. Retrieved March 15, 2009. ^ “Tobacco company gives to GOP funds”. The Oregonian. November 30, 2009. ^ Learn, Scott (July 25, 2009). “Study tests for drugs in Oregon’s wastewater”. The Oregonian. ^ “Drug & Alcohol Sanctions”. University of Oregon. Retrieved January 20, 2009. ^ a b “Mannix: Lax laws make Oregon a drug magnet”. KATU. Associated Press. December 24, 2007. Retrieved January 19, 2009. ^ Green, Ashbel S. (Tony) (September 17, 2008). “Two measures would increase Oregon prison population, but at a price”. The Oregonian. Retrieved January 19, 2009. ^ “Official Results include State Measure No. 61 and 57” (PDF). Oregon Secretary of State. Retrieved January 19, 2009.